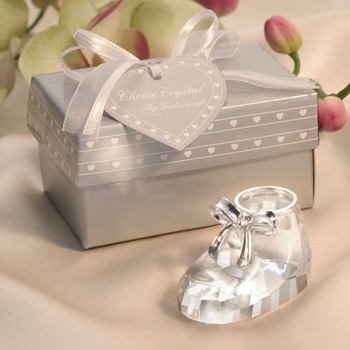 This adorable crystal baby shoe favor serves as a special keepsake for your baby shower guests. These charming crystal baby booties are just the right mementos to accompany birth announcements too! Every crystal baby shoe is 2 by 1 1/8 inches and features a sparkling crystal baby shoe that is highlighted by a shimmering silver metal bow. Packaged on a bed of satin in a delightful silver heart box, it is fastened with a white satin ribbon that is gathered into a bow. A crystal heart is affixed on top with a tag on it to complete this eye-catching favor. Please note: The tag seen in the photo cannot be personalized; however, custom Tags or Stickers can be purchased ($.35 each) for you to add an extra special touch to each of these key chains! Please click on More Images above to see how it is presented in the gift box. I purchased these beautiful crystal glass shoes as giveaways for the christening of my first-born son. I fell in love with it instantly, same with my guests who all had praises for the giveaways. ProsThe glass shoe is very elegant, and fits within my budget.